On Saturday 9th August, Phill Fung, Ray Chin Lee, Richard Changur, Robert, Jenny and Richard Tang and I paddled part of the Otoire River. Phill and Ray in their singles, Jenny and Rick did one of my Quads and Robert, Richard and I did the other quad. This paddle was something I wanted to do for a very long time and it turned out to be different than I thought it was going to be. I knew it would be longer and tougher than anticipated, which of course it was. It took us over 2 hours to reach Mafekin and the bridge by Mayaro. I was hoping the water colour would improve and we would get into more natural areas. As you can see the water never improved and we never got out out of human impacted areas, so in that way it was dissapointing. We did see many birds but no Manatee and only one possible caiman. While it was a fun paddle and is something I would do again, its not something I would do as a tour. Maybe an explore further along the river will be a better paddle. 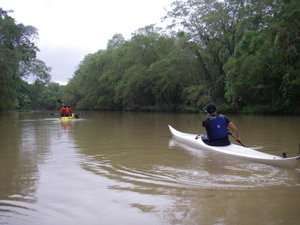 What I really want to do next is to explore up the Nariva River and to see if we can connect to Plum Mittan, though this would probably be a 6 to 8 hour paddle. The water looks much better and I think the possibility of of Manatee, Caiman, Macaws and lots of birds will be much higher. The Ortoire River is a large river in Trinidad and Tobago. 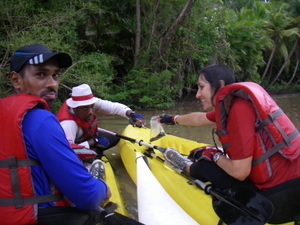 It forms the boundary between the counties of Nariva and Mayaro in east Trinidad.I like this type of River. I am planning of going to Spain, and would like to know if I could travel to spain with my swiss resident permit and my other passport (as I can travel to france with my swiss resident permit)? And the guys traveling with me has a shengen visa, is that okay? Kayak is such a nice sport man, I love practicing it and traveling all over the world to the best rivers on each location! Chile was probably the greatest experience.. now I know why they are so good on international competitions! Cool exploration! You guys are doing the prime of your life. I have been thinking to take a kayak training course.It looks pretty amazing how it looks. No way that river looks so dirty! It makes me puke in my mouth! I recognized it would be more time and difficult than estimated, which of course it was. It took us over 2 time to arrive at Mafekin and the fill by me.